Looking for a side dish for your 4th of July barbecue this weekend? This broccoli salad is it. Full of flavor (and pretty healthy!) with sweet cranberries and a little crunch in the form of toasted almonds. Hope you all have a safe & fun holiday weekend! 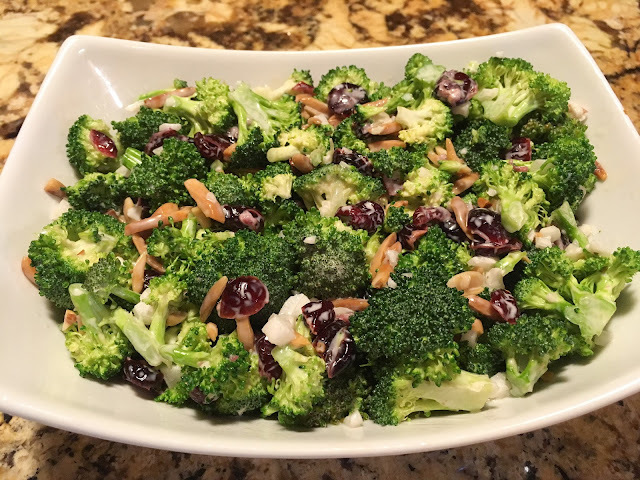 Wash broccoli and chop into small florets. Place in a large bowl and set aside. Chop onion finely and add to the broccoli. Spread almonds evenly over a small baking sheet and add 1/2 tablespoon of melted butter. In a toaster oven (or regular oven) toast the almonds under the broiler. Stir every couple of minutes until golden brown. Watch closely because they are known to go from white to burned in what seems like a matter of seconds. In a small bowl combine 1/2 cup of mayo, the honey and lemon juice. Whisk until creamy. 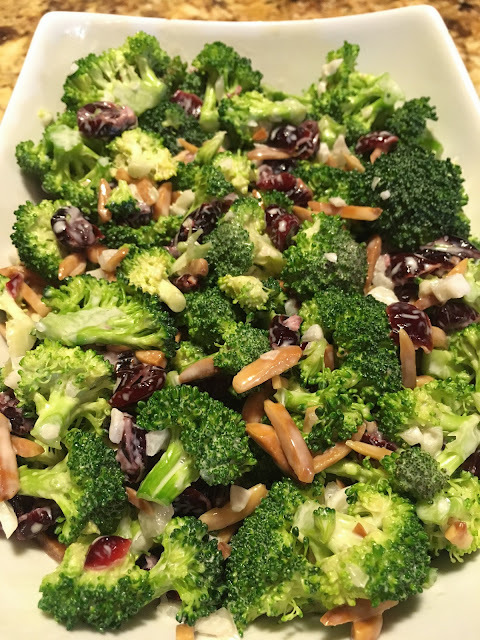 Pour over the broccoli and add the toasted almonds & cranberries. Stir until everything is lightly covered with the sauce, then add more mayo as desired. Sprinkle a couple pinches of sugar and season with a little salt & pepper to taste. Enjoy!